Children often picture their mother as a magical, caring, generous being. They see these qualities in the fairies that they hear of and relate them to their mothers. A mother is there to care for their child, just as fairies often do. One can see this same statement within some of the stories in “English Fables and Fairy Stories” written by James Reeves. This book was dedicated to his mother. Joan Kiddell-Monroe illustrated the CLA text and designed beautiful images for almost every story within the book. The book was first published in 1954 by Oxford University Press in London. The purpose of this exhibit is to use the story, “The Tulip Bed” found within the text to examine fairies as the representation of a motherly figure for children. The story, “The Tulip Bed” was written by James Reeves. He has written a planned series of folk and fairy tales from many different countries. 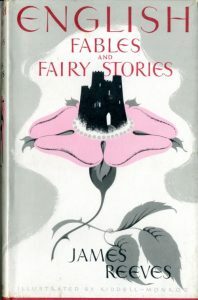 “English Fables and Fairy Stories” is a part of the series. Reeves writes to a child audience since some of the stories he has written have become available to children for the first time. Since Reeves also dedicated this particular book to his mother it could mean that these are stories that remind him of his childhood. It could also mean that these stories make him think of his mother when reading and writing them. According to Dorothy Howard, “Such books as these, with documentation, could find a deserved permanent place on children’s bookshelves.” (Howard, 168). 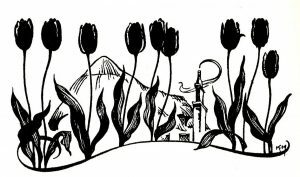 “The Tulip Bed” is found within Reeves book “English Fables and Fairy Stories”. It is a short fairy tale found on pages 98-102. The story starts in the West Country at an old woman’s cottage. The old woman had a little garden that she took much pride in growing. Within the garden were tulips. Fairies lived in a field near the old woman’s cottage. Once the fairy babies would not sleep properly in their original cradles the fairies began bringing the babies to the tulips to sleep in because they rocked in the wind. This shows how the fairies care for the well-being of their children like mothers in real life do as well. They would sing sleepy songs and soft lullabies to the babies. A lullaby is a soft, soothing song which mothers will sing to their children to get them to sleep. According to Anne de Vries, “Each of us is acquainted with the rhythm of rocking and lulling before we are born: it repeats the heartbeat heard in the womb, and thus our first literary and musical activities have a biological background.” (Vries). One can see how the fairies act as a mother from reality with the lulling to sleep of the children and the rocking in the wind of the tulips. With the fairies living in the tulip bed they give the flowers a sweet scent and make them grow bigger and straighter. This relates to a mother from reality because they spend their lives making their babies grow up into proper human beings, just like how the fairies make the tulips grow perfectly. Every evening the fairies go to the fields and sing and dance in honour of their queen. After a while, the old woman believed her garden was under protection of fairies because the flowers were so perfect every year. This shows how people don’t think something so amazing can happen and therefore they blame a more magical creature. This can be seen in everyday life with children who believe that their mother is magical because she helps them feel better when they are sick, as an example. Sadly, the old woman passed away one winter. The fairies became angry when the new owner of the cottage took the tulips out of the garden. The fairies are very protective of their children and their home, just like mothers are. In the story they go to the length of not allowing anything to grow in the new garden the owner created. This is relatable because mothers will often do anything they can in order to protect their children. To show respect for the old woman who provided them their home, they look after her grave and sing for her at every full moon. The mothers doing this show the children how to be respectful to those who treat them well, just as mothers in real life do as well. The story ends explaining how the fairy who sang the sweetest at her grave was the first fairy to ever sleep in the tulips. This shows how the mother teaches the child to be respectful and caring, just like her. In short, the fairies in this story not only act the same as a real life mother when it comes to protection of their children, but they also teach them life lessons in the process. Joan Kiddell-Monroe is the illustrator for Reeve’s book. She illustrated every image in the book, as well as the cover page and endpapers. This shows that Reeves really enjoyed Kiddell-Monroe’s images and thought that they represented his stories really well. 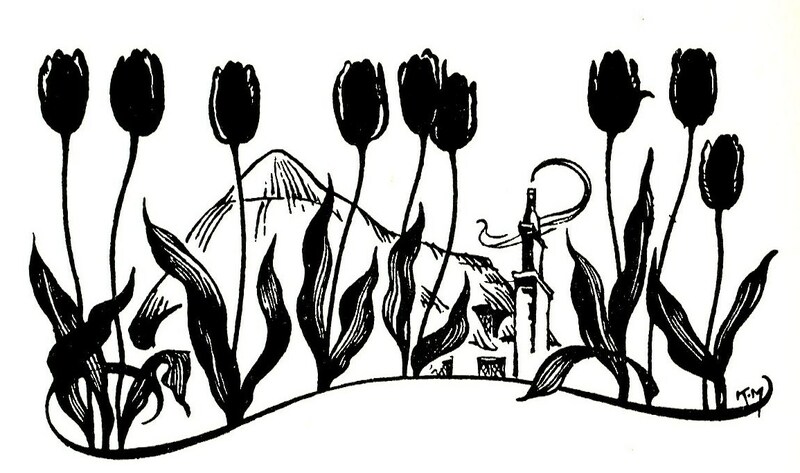 The first image seen in the story is of the old woman’s cottage and her tulips. This image addresses the reader because it helps them imagine and understand the story more. It is a simple image and easy to understand. It brings the story to life because now the reader can use this image to visualize the rest of the story. The image is also placed above the title of the story. This is helpful for someone flipping through the many stories of Reeve’s book because it is a quick idea of how the story has to do with flowers and a cottage. Kiddell-Monroe placed many images at the beginning of the stories within this book for the exact same reasoning. The image is a quick reference for the reader rather than having to read the first few lines of the story.The second image of the story is found half way through the story. 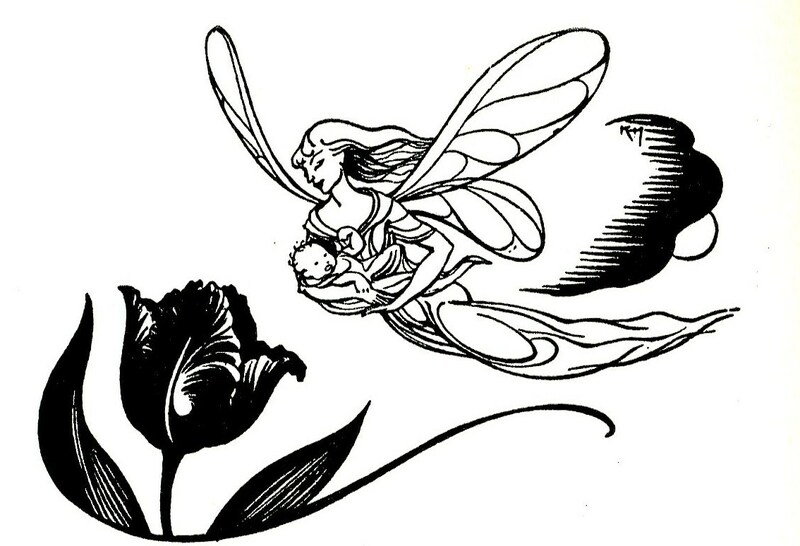 It is of a mother fairy delicately caring her baby over to the tulip flower. The mother is gazing at her child with a slight grin on her face. This shows how the mother is very caring for her child and wants it to get a good night sleep. The way that she is holding the baby also shows how protective she is of her child and how safe she is keeping it. In everyday life, a mother is often showing the same characteristics in the way that she carries her child around with her. The fairy is almost floating through the air, with her wings in clear sight which shows how magical she is. Her beauty is shown in her face and slender body and with her long hair blowing in the wind as she flies to the tulip bed. All in all, this image gives the reader a good understand what the fairies look like and the motherly characteristics of them. To end, through the use of the images in the story and the way the fairies are described one can relate the fairies to their mothers. Reeves and Kiddell-Monroe both grasp the idea that children have of their mothers and they incorporate it within the story. The way that fairies are depicted within this story is very important especially since Reeves books have been written for children. The fairies are protective, caring, gentle and respective. These are all qualities that mothers tend to have and want to teach to their children. Children look to the fairies as something and someone that they want to be.